A Wikipedia editor called Philip Cross (@philipcross63 and later @wikipedianhidin on Twitter) has a long record of editing the entries of many anti-war figures on the site to include mostly critical commentary while removing positive information contributed by others. At time of writing he is number 308 in the list of Wikipedians by number of edits. As an active editor for almost 15 years, Cross is very familiar with some of the more arcane Wikipedia rules and guidelines (along with their obscure acronyms) and uses them to justify removing information he dislikes in favour of his own inclusions. Often in a very subtle manner and over a long period of time. Anyone familiar with the work of the people he targets will recognise how one-sided and distorted those entries become. Cross is, however, much nicer to the entries of people he likes. Former hedge-fund manager and Iraq war supporter Oliver Kamm, and right-wing author Melanie Phillips, both columnists for The Times, are two examples. On Twitter, where Cross is more provocative and antagonistic, he doesn't hide the fact that he has long-running feuds with many of his targets on Wikipedia. After George Galloway, Media Lens is his second most edited article on the site. Cross is responsible for almost 80% of all content on the Media Lens entry. Cross calls his Wikipedia targets 'goons'. The list includes anti-war politician George Galloway former MP Matthew Gordon-Banks, historian, human rights activist and former UK ambassador Craig Murray, investigative journalist Dr Nafeez Ahmed, Edinburgh University professor Tim Hayward, Sheffield University professor Piers Robinson, and media analysis group Media Lens. How this behaviour doesn't fall foul of Wikipedia's rules, we don't know. Especially as his efforts, in addition to misleading the public, have serious consequences for the people targeted. Cross' activities are now finally getting some attention thanks to more of his targets speaking out on Twitter. The story has now also been picked up by RT and the Sunday Herald. Within the cyber cloisters of academe Wikiwars are raging, with one Edinburgh professor in particular catching the flak. Tim Hayward is one of the group of academics (his colleague Paul McKeigue is another) who set up the Working Group on Syria, Propaganda and Media – or if you prefer the Times description, Apologists for Assad. The group’s questioning over whether it could be definitively concluded that the Syrian regime was responsible for the Ghouta chemical attack last month (they have also queried the Novichok attack of the Skripals) is apparently what provoked their pillorying in the Thunderer. Within hours Hayward’s Wikipedia had been strafed and apparently favourable references removed. Former ambassador Craig Murray is another who claims to have come under “obsessive attack” with his page subject to 107 detrimental changes over three days. The journalist Neil Clark has a similar story about amendments and alterations. You don’t have to be a conspiracy theorist to see that there are common threads here. All of those are – (select your own description, anti-war, assiduous, useful idiots?) – prominent campaigners on social media and in the mainstream media vigorously questioning our foreign policy. All have also clashed with Oliver Kamm, a former hedge-fund manager and now Times leader writer and columnist. See also this Sputnik interview with George Galloway. Galloway's Wikipedia entry is Cross' most edited page on the site with 1,796 edits. So far none of this has resulted in any action from Wikipedia, only dismissals from Jimmy Wales, Wikipedia's founder. Considering Cross' quite open hostility towards the people whose pages he edits on Wikipedia, it should already be apparent that he should not be editing those pages at all. Those demanding diffs (exact changes made in an edit) are really missing the bigger picture here. But let's take a look at just a few of Cross' recent edits. His edit history goes back many years, so this will only be a tiny sample. We encourage those targeted by Cross to send links to edits made to their pages so we can try to highlight them here. Each of the images here shows, on the left, a section of a Wikipedia entry before Cross' edit, and to its right, what Cross changes it to. Cross doesn't like Sheffield University professor Piers Robinson. ...and throws in an unsourced claim about journalist Eva Bartlett (someone else he doesn't like) and then tries to make a tenuous, defamatory connection between Robinson and another one of his targets (journalist Vanessa Beeley). Cross likes Iraq war supporter, former hedge-fund manager and Times columnist Oliver Kamm. Oliver Kamm is notable when examining Cross' edits, because, although Kamm himself is not a very significant figure (perhaps known more for being tasked to slur Chomsky by the Henry Jackson Society), he appears to be one of Cross' favourite people. On 7 February I published an article calling out Kamm for publishing a blatant and deliberate lie about me. The very next day, 8 February, my Wikipedia page came under obsessive attack from somebody called Philip Cross who made an astonishing 107 changes over the course of the next three days. Many were very minor, but the overall effect was undoubtedly derogatory. He even removed my photo on the extraordinary grounds that it was “not typical” of me. The word 'Kamm' appears in the @Wikipedia entry for Media Lens twelve times. 'Media Lens' appears in Oliver Kamm's entry....zero times. Just one reason why @jimmy_wales's focus on 'diffs' as evidence of bad faith is misplaced. Cross likes right-wing Times columnist Melanie Phillips. 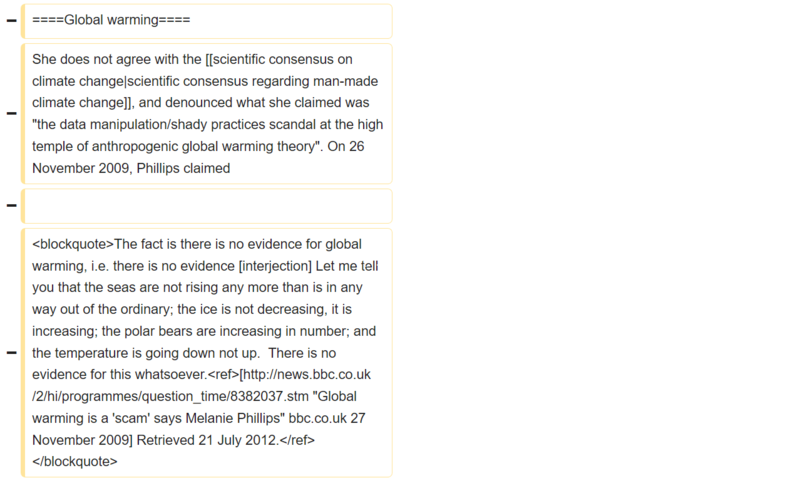 So why should anyone have to learn about Phillips' climate change denial? Cross removed the section wholesale. Cross doesn't like media analysis group Media Lens. Peter Barron, the former editor of the BBC's ''Newsnight'' commented in November 2005 that although Cromwell and Edwards "are unfailingly polite", he had received "hundreds of e-mails from sometimes less-than-polite hommes engages - they're almost always men - most of whom don't appear to have watched the programme" as a result of complaints instigated by Media Lens. Click the image to expand it (made with WhoColor). He is very active on Wikipedia, as his time card shows. As should be clear by now, this is not a project that Cross takes lightly. He devotes considerable time to it: many hours every day and with the same intensity on weekends as on weekdays. We pulled in the dates from his user contributions page and found that Cross had not had a single day off from editing the site in almost 5 years! (Consecutive edit dates between 29 August 2013 and 14 May 2018.) You'd have more free time to spend on leisure activities pursuing a regular full-time job than Cross has editing Wikipedia. 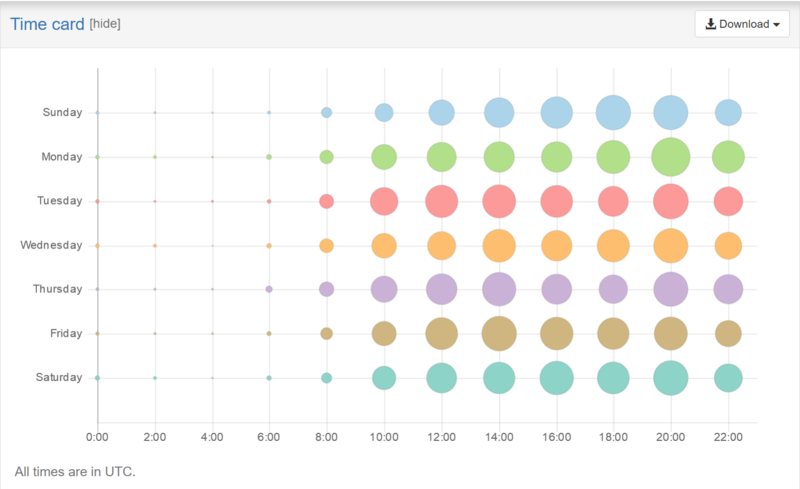 Note: Some people have pointed out that because the graph above is based on aggregate data spanning many years of edits, it should not be interpreted to mean that Cross always follows a strict schedule and only edits at the times shown. Zero evidence of COI [Conflict of Interest]. Galloway has picked a fight with Cross, not the other way around. This despite the fact that Cross has admitted a "big conflict of interest" (although that hasn't stopped him from continuing to edit these pages). ‘Philip Cross’ has edited @georgegalloway ‘s wikipedia page over 1800 times. George finally responds and offers a £1000 reward for Cross’s identification and it is he who is accused of ‘picking a fight’. This takes victim-blaming to a whole new level. Despite Wikipedia's inaction, this story has continued to spread on Twitter and found its way on to Hacker News where it reached the number 1 spot and generated a big discussion. The topic is now being discussed on Wikipedia's Administrators' noticeboard. User:NeilN, I found three veteran, experienced editors expressing serious concerns about Philip Cross's edits. In December 2015, User:John (207,744 edits since 2006-01-08) wrote, "Tentatively endorse a topic ban on the basis of the talk page comment, and more especially on the apparent inability to see that comments like this will be seen as problematic." He later added, "Count me as a 'support' topic ban." That same month, User:Guerillero (18,031 edits since 2009-11-07) wrote, "I support a topic ban after this revert. Philip Cross seems to be focused on coatracking as much negative information about Sr Mariam as possible into the article." 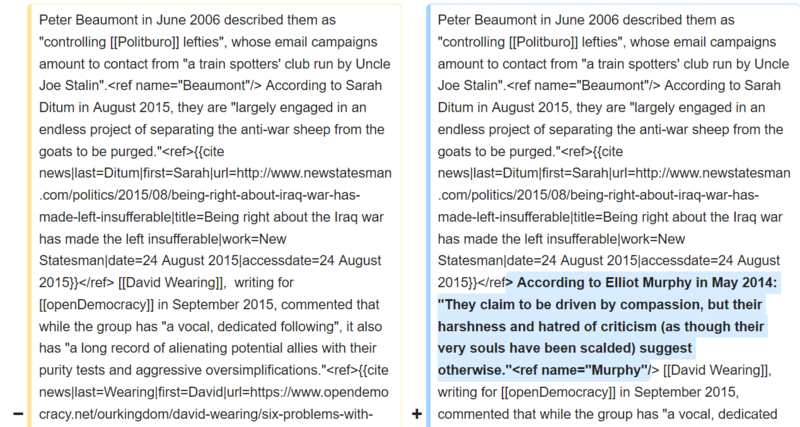 In February 2016, User:AusLondonder (24,968 edits since 2015-04-17) wrote, "I have noticed myself an inappropriate pattern of editing by Philip Cross relating to left-wing British organisations and individuals. That needs to stop." This contribution was removed after KalHolmann posted it (supposedly "accidentally") by admin NeilN and added back in by admin Nyttend. In a sane world, someone finding and contributing useful information, as KalHolmann has been doing, would be thanked. In the bizarre world of Wikipedia, KalHolmann is instead threatened with a ban. Don't trust what you read on Wikipedia! Please spread the word to anyone who's unaware of the extent to which Wikipedia can be manipulated in this way. And if you'd like to see some action taken by Wikipedia, please tweet Jimmy Wales and let him know. If you'd like to get in touch about anything here, please email fivefilters@fivefilters.org or tweet us @fivefilters.